In his classic guide to Mexican cooking, Rick Bayless’s Mexican Kitchen, Bayless writes of this recipe, “this is one place where pork fat makes an enormous flavor difference.” It’s true. Like most things in life, these beans are even better with some bacon. 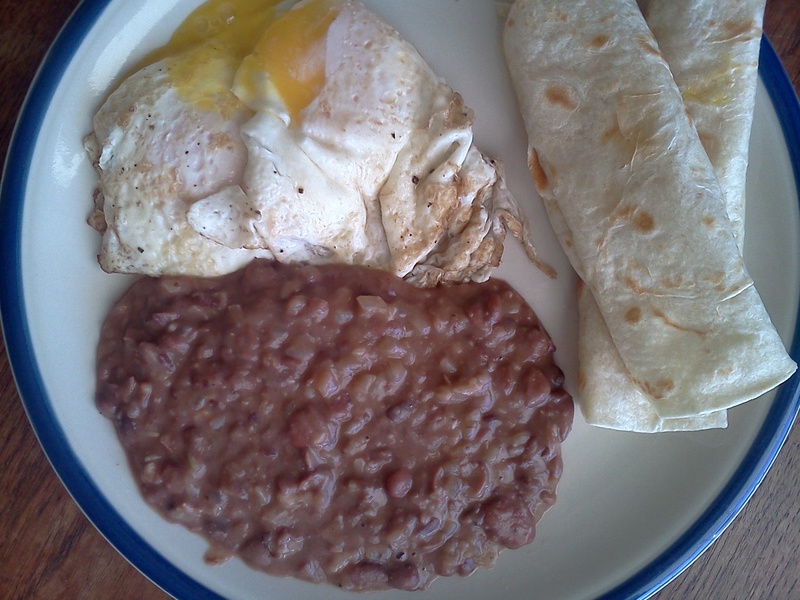 But this version, made with pinto beans cooked in the slow cooker with kombu, is quite good. Thick, rich, and, well, meaty. Yet clean. In fact, my original plan for this weekend’s post included meat. I had planned to make an elaborate steak chili based on one that an intern in my office made for the fall pot-luck. (Yes, my office has a pot luck. I am very, very lucky.) But then I noticed that my bank balance was a bit off after my first post-divorce, new federal filing status paycheck. Less than it was supposed to be. Apparently the single-person tax is higher. So I now have even less money. Which isn’t great. But it could be worse. I don’t always appreciate everything that I have. Because I’m a hopelessly flawed human. Usually, though, if given sufficient time to ponder, I manage to come up with something reasonably positive. At least in writing. It’s my strategy for avoiding misery. So. The upside to my new financial reality. First, I really like beans, which are notoriously affordable. Second, while I would prefer to have more money, I still have enough. And I have so much more than many, a fact that I’m reminded of every day that I spend out in the world. I may not be wealthy, but I am not poor. Indeed, I’m quite insanely over-privileged. And grateful. Of course, this process is a lesson I am only just now beginning to learn. It is very new. So I fail, again and again. Yet each time I fail, I do so with more grace, as I slowly learn that this is what it means to live. To breathe into and from the space in between moments, letting go of the illusion that anything is ever under control. The reward is resilience. Quickly realizing that it’s okay to not make the steak chili. There’s always another option. Just don’t freak out. And, if you do freak out (I always freak out), don’t freak out about freaking out. It will be okay. The cool thing is that now, almost a year after I went from once or twice a week yoga to a more regular practice of 3-7 days a week, I generally live in a more resilient place. So it was pretty easy for me to let go of the steak chili, think about what food I had, and decide to keep it super simple. So, yesterday morning, even before I went to yoga, I started the beans. Assuming you are neither soaking nor brining, start by sorting through and rinsing one pound of dried pinto (or any variety of) beans. Discard any that are broken or discolored, rinse, and put in the insert of your slow cooker. Cover with about three inches of cold filtered water, add a 3″ piece of kombo, place the lid on the insert, and cook on low for 8-10 hours, or until the beans are tender. You want them to be on the soft side, so if you aren’t sure, cook a little longer. Once they’re done, salt liberally and allow to cool. The cooling period lets the salt fully permeate the beans. This amount will be enough to double the following recipe. If you’re making less, freeze the extra beans, making sure they’re covered by cooking liquid, or reserve for another use. Now for the recipe. The following amounts make about 2 cups, enough to serve 1-2. Feel free to double if you’re cooking for more. 1. Heat the fat in a large cast iron or nonstick skillet over medium heat. Add the onion and cook, stirring, for about 10 minutes. Add the garlic, cook for a minute or two, and then add approximately one cup of beans, using a slotted spoon. Mash the beans coarsely using a potato masher or the back of a wooden spoon. When they’re mashed to your liking, repeat with another spoonful. Continue until you’ve incorporated all of the beans. 2. 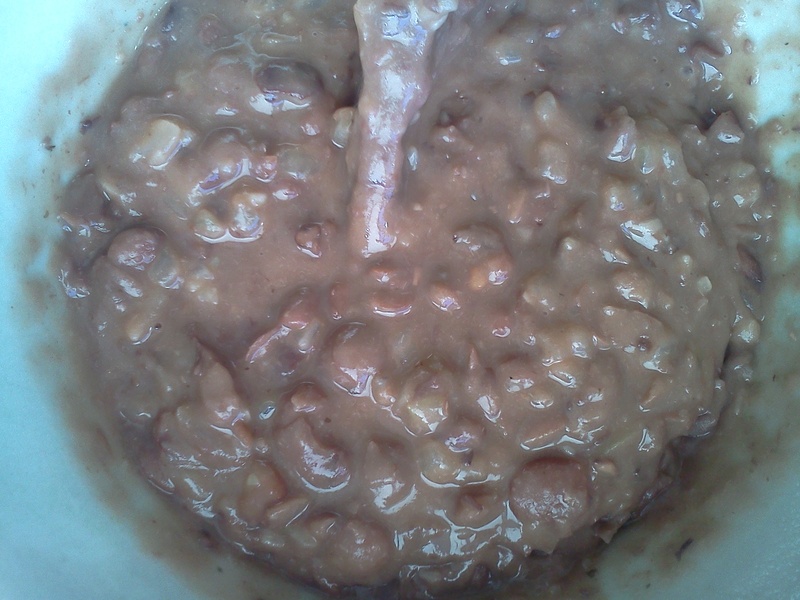 Once all the beans have been mashed, add about 1/2 cup of the bean cooking liquid or, if you’re using canned, water. (Bean cooking liquid alone is enough reason to make your own beans. It’s so good!) Stir the liquid into the beans and continue to cook until the beans are just a little more soupy than you want them to be. They will thicken once you take them off the heat. Salt to taste and serve, either as a side for fried eggs, as I did this morning, as a filling for burritos, or as a side. Or, if you’re feeling incredibly lazy, eat them as is, with tortilla chips, as I did last night. It’s true that this doesn’t rate super high on the scale of excellent single person self-care, but, well, there are more shameful suppers.